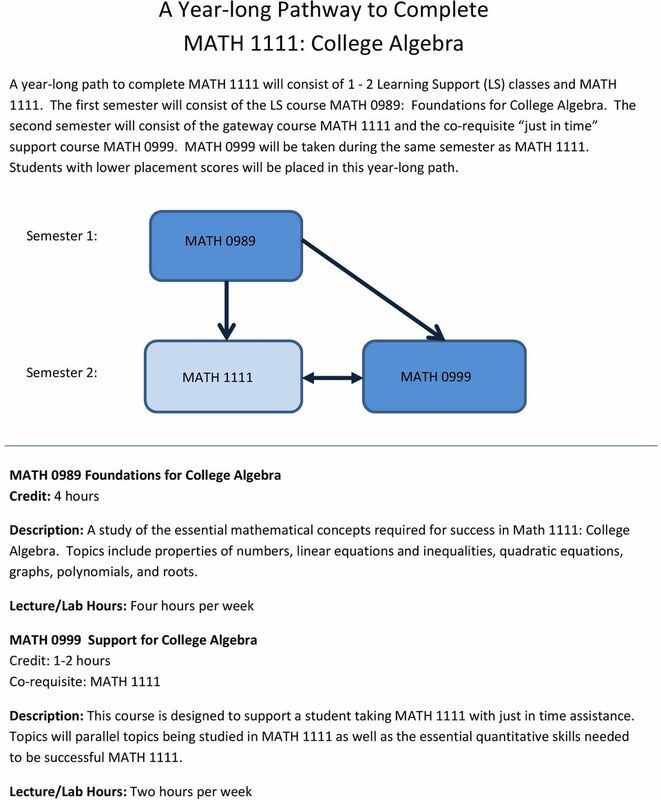 Download "A Year-long Pathway to Complete MATH 1111: College Algebra"
3 instructor. An instructor could also record their own instructional videos to be used in this model. The entire class could be flipped or only flipped on certain days. III. Student support models An ancillary student support model is an important component of a successful pathway through gateway mathematics. Many institutions have an Academic Resource Center (ARC) with Mathematics tutors. Such tutors are useful for the timid student who fears instructor s office hours. Middle Georgia State College on their Macon campus has created a Mathematics Academic Resource Center (MARC) is solely for mathematics tutoring and also has computers for students to use with ALEKS and online homework systems outside of class. The Director and Assistant Director have bachelor degrees in mathematics. Tutors are mathematics majors. Students are allowed to sign up for up to 2 hours of tutoring per week. This support model has been highly successful and an integral part in promoting increases in success rates in gateway mathematics courses. 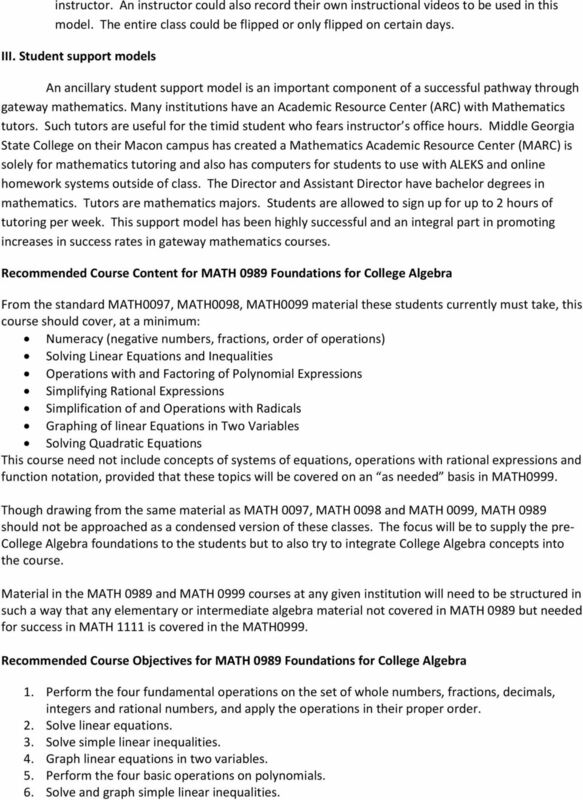 Recommended Course Content for MATH 0989 Foundations for College Algebra From the standard MATH0097, MATH0098, MATH0099 material these students currently must take, this course should cover, at a minimum: Numeracy (negative numbers, fractions, order of operations) Solving Linear Equations and Inequalities Operations with and Factoring of Polynomial Expressions Simplifying Rational Expressions Simplification of and Operations with Radicals Graphing of linear Equations in Two Variables Solving Quadratic Equations This course need not include concepts of systems of equations, operations with rational expressions and function notation, provided that these topics will be covered on an as needed basis in MATH0999. Though drawing from the same material as MATH 0097, MATH 0098 and MATH 0099, MATH 0989 should not be approached as a condensed version of these classes. 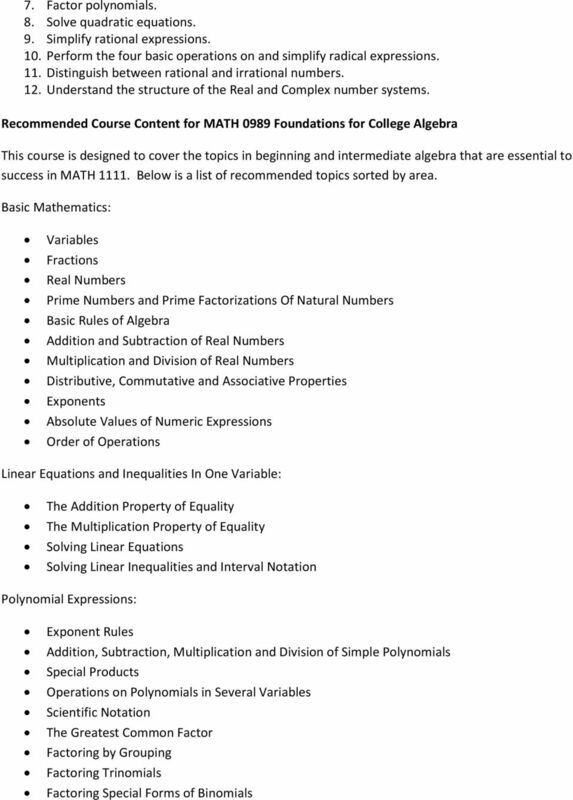 The focus will be to supply the pre- College Algebra foundations to the students but to also try to integrate College Algebra concepts into the course. Material in the MATH 0989 and MATH 0999 courses at any given institution will need to be structured in such a way that any elementary or intermediate algebra material not covered in MATH 0989 but needed for success in MATH 1111 is covered in the MATH0999. 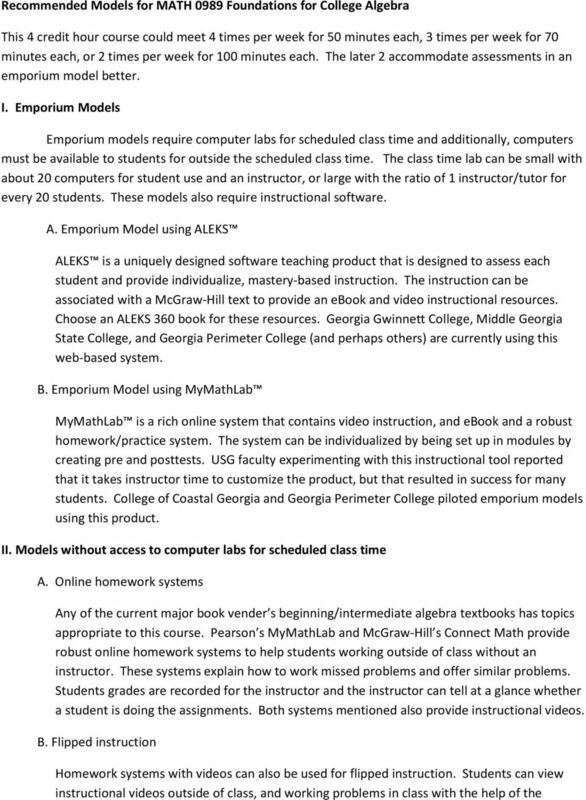 Recommended Course Objectives for MATH 0989 Foundations for College Algebra 1. Perform the four fundamental operations on the set of whole numbers, fractions, decimals, integers and rational numbers, and apply the operations in their proper order. 2. Solve linear equations. 3. Solve simple linear inequalities. 4. Graph linear equations in two variables. 5. Perform the four basic operations on polynomials. 6. Solve and graph simple linear inequalities. 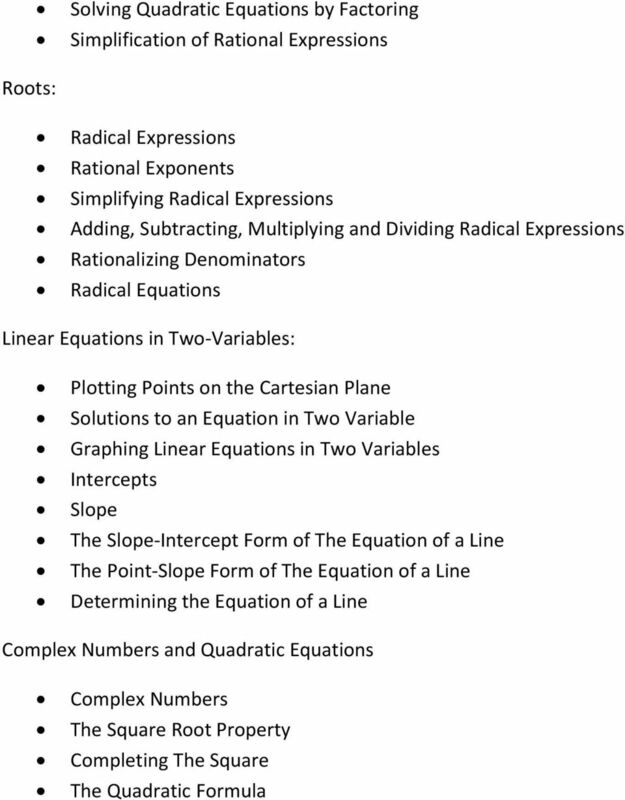 Date: Section P.2: Exponents and Radicals. Properties of Exponents: Example #1: Simplify. a.) 3 4. b.) 2. c.) 3 4. d.) Example #2: Simplify. b.) a. Properties of Exponents: Section P.2: Exponents and Radicals Date: Example #1: Simplify. a.) 3 4 b.) 2 c.) 34 d.) Example #2: Simplify. a.) b.) c.) d.) 1 Square Root: Principal n th Root: Example #3: Simplify.